CopperPro. High Quality Copper Threaded Fibers Keep Bacteria And Moisture Away For Healthy Looking and Feeling Hands. The Compression Therapy Promotes Blood Circulation and Increased Oxygenated Blood Cells While Wearing The Copperpro. Gloves. This is great for tired hands due to physical labor, typing, arthritis, joint inflammation, and any other hand problems. With the microThreaded Copper Inserts, the glove will wrap around your hands giving you full support around your joints and wrist. The compression therapy also contributes to the added support that the CopperPro. Gloves bring to you. Experience the effect and you will never go back to tired achy hands and wrists. The finger-less design helps keep your senses in control while using the gloves. Use while gardening, Driving, Playing sports like golf or while lifting weights, use for cycling, while working, or you can even have them on while running your everyday errands to maintain efficient blood circulation and pain relief. FUNCTIONAL GLOVES AND COMPRESSION SOCKS: CopperPro. High Quality Copper Threaded Fibers Keep Bacteria And Moisture Away For Healthy Looking and Feeling Hands. The Compression Therapy Promotes Blood Circulation and Increased Oxygenated Blood Cells While Wearing The Copperpro. Gloves. This is great for tired hands due to physical labor, typing, arthritis, joint inflammation, and any other hand problems. 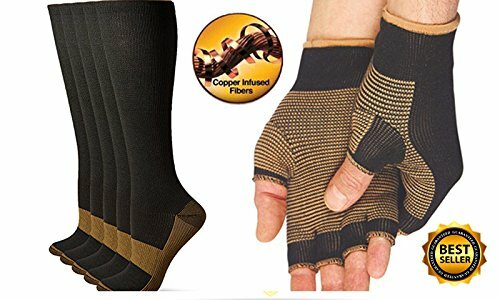 STYLISH LOOK AND LUXURIOUS FEEL: With the microThreaded Copper Inserts, the glove will wrap around your hands giving you full support around your joints and wrist. The compression therapy also contributes to the added support that the CopperPro. Gloves bring to you. Experience the effect and you will never go back to tired achy hands and wrists. MULTIPURPOSE USE: The finger-less design helps keep your senses in control while using the gloves. Use while gardening, Driving, Playing sports like golf or while lifting weights, use for cycling, while working, or you can even have them on while running your everyday errands to maintain efficient blood circulation and pain relief. MOISTURE-WICKING: The CopperCo. Glove and Sock Set will ensure your hands and feet stay dry and comfortable at all times. Designed to kill odor causing fungi and bacteria, the copper threads are ideal to sport players, physical workers, at home moms, and many other people. use without sacrificing comfort or thousands of dollars on unproven remedies. View More In Padding Supplies. If you have any questions about this product by CopperCo., contact us by completing and submitting the form below. If you are looking for a specif part number, please include it with your message.